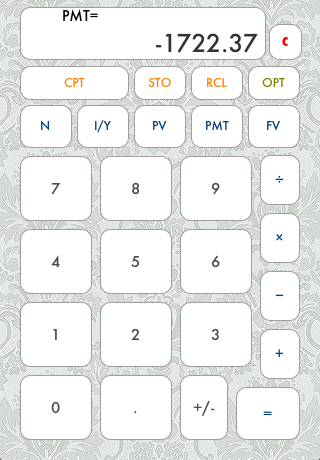 Version 1.2 will hit the market in a few days with Amortization Schedule feature. Enjoy the update! Press [OPT] button and change the periods/year setting to Yearly (1) for your Finance 101 class before pressing 1 star for the review. If you are rating this app poorly to promote your app then that's fine - I'll take it. Even if you know what to do intuitively, still read THE MANUAL to learn about the memory function. It may come in handy at times when you may want to see what's stored in TVM buttons. Following through this CHEAT SHEET will make a good brain exercise too.